Circus Circus provides a fun-filled Las Vegas experience at an affordable price. 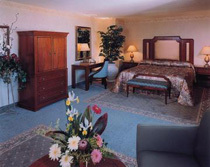 First-time and returning guests revel in the excitement, amenities and appeal of this exhilarating destination resort. Cobblestone walkways, appealing restaurants, thrilling rides, eye-catching shops, exciting games and the world’s greatest circus acts guarantee good fun for everyone. 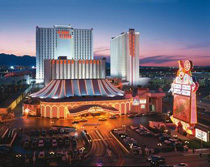 The resort’s 3,700 standard rooms that provide comfortable, affordable accommodations with easy access to all the excitement Circus Circus and Las Vegas has to offer. Guests will find several room options located throughout the property’s more than 68 acres, each with a different appeal. The 15-story Casino Towers are situated in the center of the property; the 29-story Skyrise Tower features its own casino and pool while the 35-story West Tower serves as a gateway to Circus Circus’ indoor theme park, The Adventuredome. For those with a love of the open road, KOA Circusland RV Park offers 400 spaces on more than 23 acres as well as a 24-hour convenience store, game arcade, laundry facility, pool, hot tub, sauna, playground, pet run, disposal station and a large meeting room. Additionally, Circus Circus Manor provides convenient motor lodge-style accommodations. Guests in search of non-stop gaming action will find three full-size casinos with more than 101,000 square feet of gaming space. A Race & Sports Book is located on the main level of the Casino Tower. As an added feature blackjack, roulette and craps lessons also are available to guests. Since 1968, many of the world’s greatest circus acts have plied their craft under the famed Circus Circus Big Top. Performers from around the globe have made this the world’s largest permanent circus. Visitors are treated to dazzling aerialists, trapeze artists, clown comedy shows and more. Surrounding the stage is a huge midway where players can win adorable stuffed animals by participating in a variety of traditional carnival games. 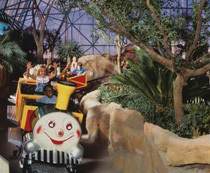 The Adventuredome at Circus Circus is Nevada’s largest indoor theme park and the only theme park in Las Vegas. Open year-round, The Adventuredome maintains a constant temperature of 72 degrees, perfect for non-stop family fun. The park features exciting rides such as The Canyon Blaster, the world’s only indoor double-loop, double-corkscrew roller coaster and the new SpongeBob SquarePants 4-D ride. A dining experience not soon to be forgotten can be found inside THE Steak House at Circus Circus. “Best Steak House" by the Las Vegas Review-Journal Readers’ Poll, THE Steak House offers guests the best quality Midwestern beef in an elegant, Old World setting. Prime cuts are prepared over an exhibition-style, open-hearth mesquite charcoal broiler. Additional dining options include The Garden Grill offering American, Asian, Italian, Mexican and Seafood specialties; a Pizzeria featuring freshly baked pies as well as mouth-watering calzones, sandwiches and salads; and the Circus Buffet serving breakfast, lunch and dinner, daily. Other dining options include Mexitalia and Casino Café. Couples are invited to exchange vows inside Chapel of the Fountain – the first and longest-running, hotel-casino wedding chapel in Las Vegas. Featuring romantic renaissance décor, the chapel offers the services of an in-house photographer, videographer and florist to ensure a picture-perfect wedding day. With over 21,000 square feet of meeting and banquet space, Circus Circus is a perfect choice for any event you may be planning. Speak to its friendly staff for help with your next event. Guests also have access to audiovisual equipment and its full-service business center. Book Online for Best Circus Circus Las Vegas Rates! All Trademarks, Copyrights, and other brandings are property of their respective companies. © 2007, Live Long, Well! LLC. All rights reserved worldwide.